Saturday, September 23, 2017 – 8 p.m. This article is part of a continuing OttawaJazzScene.ca series showcasing jazz musicians regularly playing in Ottawa-Gatineau. 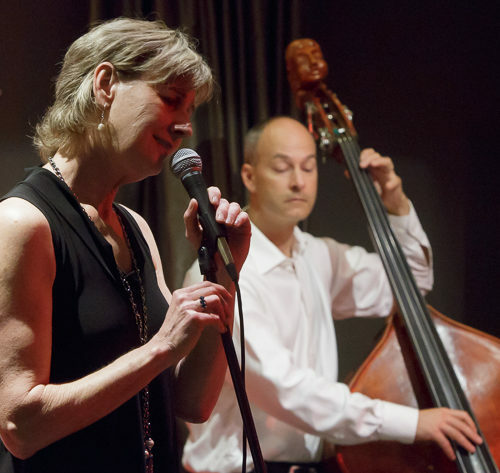 Ottawa vocalist Anne Lewis knows her jazz standards – and not just the common ones. During a full evening of song, she combined the classic sounds of George Gershwin and Cole Porter and Richard Rodgers with the less-well-known Carl Sigman, Luiz Bonfá, and Bernice Petkere – and many more. Long-time favourites like “Bye Bye Blackbird” and “All of Me” were given their upbeat due, but also intimate songs like “I’ve Never Been in Love Before” and Broadway numbers like “Almost Like Being in Love”. She gave particular pride of place to songs popularized by 50s/60s vocalist Julie London, including the dramatic “Nice Girls Don’t Stay for Breakfast” and the torch song “Cry Me a River”. Since she returned to Ottawa’s jazz scene in 2014, Lewis has been a regular at local jazz venues, and particularly at the Options Jazz Lounge at the Brookstreet Hotel in Kanata. On the evening we heard her there, she attracted a noticeable crowd of vocal jazz fans seated at tables and bar seats near the stage – including several other Ottawa jazz vocalists. They listened intently and applauded each number. During “A Sleepin’ Bee”, one couple got up and started dancing to its syncopated rhythms and Lewis’ vivacious scatting – and continued through other songs as well. Lewis is legally (though not fully) blind, but that hasn’t affected her connection with the audience. Never needing to glance at a lyrics sheet, she delivered each song with aplomb and gave it its full due, whether a ballad or an upbeat number. I particularly enjoyed her sophisticated “Love for Sale”, the show-stopper “Cry Me a River”, the warm “I’ve Never Been in Love Before”, and the bright “This Can’t Be Love”. She gave “The Gentle Rain” a heartfelt and haunting rendition, easily immersing herself in its bossa rhythms. Performing with Lewis were pianist J.P. Allain and bassist Normand Glaude, two musicians who are favourites of local vocalists. Allain in particular has an encyclopedic knowledge of and love of standards, and easily fit his style to hers. The two introduced each set with instrumental duos: “La Vie on Rose”, with its melodic piano and intimate bass solo, was a charmer. On “Almost Like Being in Love”, Allain’s ebullient piano perfectly suited the mood and the vitality of Lewis’ vocals. On “I Wish You Love”, Glaude added an intense harmonica solo and an emotional bowed bass solo which nicely counterpointed the tune’s melancholy. Near the end, her voice and his harmonica joined together, and the song ended with her holding a long high note and his harmonica slowly fading out. Surprisingly and unusually for Options, the crowd became noisier during the third set, after some of the jazz fans packed it in for the evening. But that set provided some of the loveliest music of the session, with a series of “Moon” songs: the energetic “Fly Me to the Moon” (a hit for Julie London as well as Frank Sinatra), a playful “Old Devil Moon”, and a gentle and romantic “Moon River”. The trio ended the show on a high and fast note with a joyful version of “Happy Talk”. Lewis also writes her own songs, although she didn’t perform any of those at this show. On January 27, 2018, she will release her CD of original material, Expressions, at the National Arts Centre’s Fourth Stage. Anne Lewis returns to the Options Jazz Lounge at the Brookstreet Hotel on Friday, October 20, this time performing with guitarist Tim Bedner and bassist Tom Denison.